Activated carbon adsorption is a powerful technology for removing organic contaminants from water. Information about adsorption isotherms is important to select the most effective activated carbon for water treatment applications. Many activated carbons with different physical and chemical characteristics are manufactured, and only few isotherm data are available for the more than 100,000 chemical substances and mixtures that have been or are currently being produced. As a result, the selection of the most cost-effective activated carbon presents a challenge to water treatment professionals. In addition, collection of adsorption isotherm data can be difficult because of a compound’s toxicity, analytical challenges (instrument availability, cost), and time requirements to complete the experiments. Therefore, the development of a model capable of predicting the adsorption capacity of activated carbons from fundamental adsorbent and adsorbate properties would be of great benefit to the water treatment industry. (pharmaceutically active compounds, endocrine disrupting compounds, chemical warfare agents, fluorotelomer alcohols, and brominated flame retardants). temperature-independent function of the adsorption potential (ε). To apply the PDM model, a reference curve is constructed from adsorption isotherm data for a reference compound, such as benzene, that establishes the relationship between V and ε for a given activated carbon. It is then assumed that affinity coefficients (β) exist such that the relationship between V and ε /β for 2 compounds other than the reference compound coincides with the reference curve. Thus, β is a measure of an adsorbate’s affinity for the activated carbon surface relative to the reference compound, for which a β-value of one (1) is assigned. To apply the PDM model to aqueous contaminants, the affinity of water for the activated carbon surface needs to be known as well (7-9). The affinity coefficient for water was estimated from the adsorbent oxygen content using a correlation developed previously in our research group (9). Affinity coefficients of individual adsorbates were estimated from adsorption isotherm data collected by the U.S. EPA for 62 neutral organic contaminants. These affinity coefficients were used to develop a poly-parameter QSPR that permits the estimation of a contaminant’s affinity coefficient from molecular descriptors. Molecular descriptors were calculated with the semiempirical quantum mechanics software MOPAC. Adsorption isotherm data for 62 neutral organic contaminants were obtained from the U.S. EPA. The adsorption isotherm data were collected for contaminants that are currently regulated or are of regulatory interest. Compound classes that were represented in the data set included halogenated aliphatic hydrocarbons, benzene and substituted benzenes (including halogen- and nitro-substituents), triazines, carbamates, chloroacetanilides, organochlorine compounds, ketones, and one ether. Three activated carbon samples [F400(old), F400(new) and Norit1240], with which adsorption isotherm data had been collected, were obtained from the U.S. EPA and characterized at NC State University (Table 1). 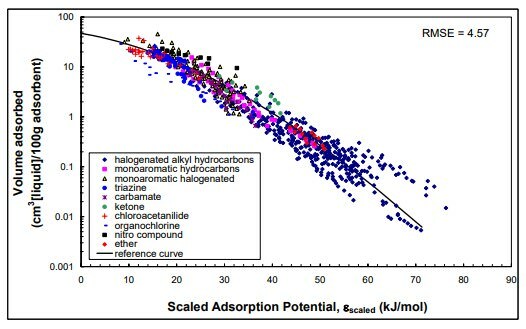 Five additional activated carbon samples were characterized (Table 1); these adsorbents were used in external model validation tests. To characterize adsorbents, both N2 and CO2 adsorption isotherm data were collected (Autosorb1-MP, Quantachrome Corporation, Boynton Beach, FL). Prior to analysis, adsorbent samples were outgassed overnight at 473 K. N2 adsorption was studied at 77 K over a relative pressure range from 10-6 to 1. CO2 adsorption was studied at 273 K over a relative pressure range from 10-6 to 10-2. Oxygen contents were measured according to ASTM D5622 (Huffman Laboratories, Golden, CO). Ash contents of GACs were determined by combusting about 5 g of adsorbent in a muffle furnace at 550°C for 2 hours. The hydrophilicity of activated carbon surfaces was expressed in units of mmol O/g dry, ash-free [daf] adsorbent. where ε1,i is the adsorption potential (J/mol) of adsorbate i (N2 or CO2), R is the universal gas constant (8.314 J/mol-K), T is the equilibrium temperature (K), Psat is the vapor pressure of the adsorbate (1 atm for N2, 34.28 atm for CO2), and P is the equilibrium pressure. The adsorbed gas volume (Vgas, cm3 at STP/100g activated carbon) was transformed to condensed adsorbate volume (Vadsorbed, cm3/100g) using Equation 2, where molar volumes (Vm) of N2 and CO2 were calculated from their respective densities in the adsorbed state (ρ = 0.808 g/cm3 for N2 at 77 K and ρ = 1.023 g/cm3 for CO2 at 273 K (11). Using Equation 3, the adsorption potential of benzene (εl,benzene), the reference compound, was computed from the adsorption potential of N2 and CO2 at any Vadsorbed using the affinity coefficients βl,N2/benzene = 0.33 and βl,CO2/benzene = 0.40 (5, 11). where, a - d are regression coefficients. Figure 1 shows an example reference curve for activated carbon F400(old). Figure 1. 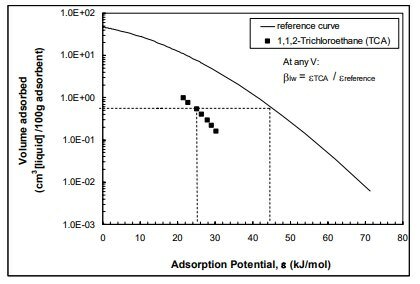 Reference curve and aqueous-phase 1,1,2-Trichloroethane (TCA) adsorption isotherm data. Adsorbent: F400(old). summarizes βw/benzene values obtained for the adsorbents evaluated in this study. where εlw,i is the adsorption potential of the aqueous target compound, and cS and ce are theaqueous solubility and liquid phase equilibrium concentration of the adsorbate, respectively. Mackay et al. (12), which recommends a most probable cs value from a range of experimentally determined solubility values; 2) the database of Horvath et al. (13), which also provides a comprehensive review of published aqueous solubility data and proposes a recommended cs value for many contaminants; 3) the PhysProp database (14); and 4) The Pesticide Manual (15). For contaminants that were solids at 24°C, the temperature at which isotherm experiments were conducted at the U.S. EPA, the subcooled liquid solubility, cs.liquid was used instead of cs. Values for cs.liquid were computed following the procedure of Prausnitz et al. (16). where Vadsorbed is the adsorbed volume, cm3 (condensed adsorbate)/100g; qe (g/100g) were obtained from U.S. EPA isotherm data, and values of molar volume and molecular weight were obtained with ChemSketch (17). βlw,i/benzene, a regression analysis was conducted, in which the sum of squares of the absolute difference between the scaled abscissa values (i.e., εlw,i/βlw,i/benzene) and the reference curve abscissa values at each experimental Vadsorbed were minimized as shown in Figure 1.
where Vm and Vw are the molar volumes of adsorbate i and water, respectively. Vs, Surface Volume (Å3/mol). The surface volume of a molecule is the volume enclosed by the molecular surface (18). The molecular geometry was optimized using MOPAC with PM3 parameters. Ed, Dielectric Energy (kcal/mol). The dielectric energy is a portion of the total energy of a molecule surrounded in a dielectric. It is the stabilizing portion that results from screening the charges in the molecule by a dielectric (19). The dielectric energy is calculated at an optimized geometry in water. The water geometry is obtained from optimization using MOPAC with PM3 parameters and the Conductor-like Screening Model (COSMO). εHOMO, Highest Occupied Molecular Orbital Energy (eV). The energy required to remove an electron from the highest occupied molecular orbital (HOMO) is expressed by εHOMO. The HOMO energy was determined after optimizing the molecular geometry using MOPAC with PM3 parameters. q- , Electrostatic Hydrogen Bond Basicity, which is represented by the most negative atom charge (acu) in the molecule (20). The QSPR relating βl,i/benzene to the four molecular descriptors listed above was obtained with the multiple linear regression option in CAChe. The molecular descriptors Vs and εHOMO were scaled by factors of 100 and 10, respectively prior to QSPR development to assure that statistical weights associated with each QSPR variable were similar. 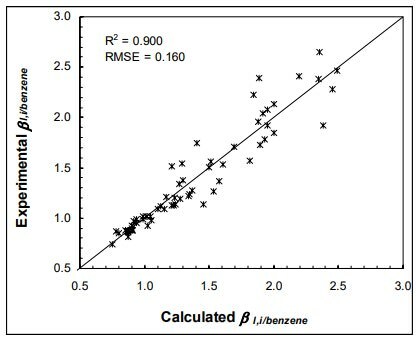 QSPR quality was assessed by comparing experimental βl,i/benzene values with calculated βl,i/benzene values. Metrics used to assess QSPR quality were the coefficient of determination, R2, the root mean square error (RMSE) and the cross-validation coefficient, rCV2. Cross-validation coefficients, rCV2, were obtained from CAChe using a 3-fold cross-validation technique, in which two thirds of the βl,i/benzene values were used to develop a QSPR, which was then used to predict the remaining third of the βl,i/benzene values. This procedure was repeated for each third, and the coefficient of determination obtained from the relationship between experimental and predicted βl,i/benzene values for all compounds in the data set was computed to obtain rCV2. results in Table 1 illustrate that the activated carbons used to collect the isotherm data for QSPR calibration [F400(old), F400(new) and Norit1240] were similar in terms of their physical structure (BET surface area, micropore and mesopore volumes) and chemical character (oxygen and ash contents). On the other hand, the five adsorbents used for external QSPR validation showed a broad range of physical and chemical characteristics (Table 1). Oxygen contents of the five adsorbents used for external QSPR validation ranged from 2.6 to 15.9%. As shown by a number of research groups (e.g. 9, 21-23), the oxygen content of activated carbons is important for the adsorption of aqueous organic contaminants because oxygen-containing functional groups enhance water adsorption and thus negatively affect organic contaminant removal. Equation 9 shows a new QSPR that relates the affinity coefficient of a contaminant to the four molecular descriptors surface volume (Vs), dielectric energy (Ed), highest occupied molecular orbital (HOMO) energy (εHOMO), and electrostatic hydrogen-bond basicity (q-). predicted βl,i/benzene values closely matched experimental βl,i/benzene values for the training set (R2 = 0.90), and the RMSE associated with βl,i/benzene predictions was 0.16 (experimental βl,i/benzene values ranged from 0.74 and 2.65). The cross-validation coefficient rCV2, which quantifies the predictive power of the QSPR, was 0.85. To further evaluate the quality of the QSPR, results of an internal validation test are depicted in Figure 3, which shows scaled isotherm data (i.e., εscaled,i = εlw,i/βlw,i/benzene) for the 46 neutral organic contaminants, for which adsorption isotherm data were collected on F400(old). Using βl,i/benzene values that were predicted with the QSPR and the βw/benzene values shown in Table 1, βlw,i/benzene values were calculated with equation 8 and used to scale the isotherm data. A RMSE of 4.57 was obtained, which represents the average difference between εscaled,i and εl,benzene at any experimental Vadsorbed. Figure 2. Relationship between experimental βl,i/benzene values and βl,i/benzene values calculated with the QSPR model. Straight line depicts 1:1 relationship. Figure 3. Scaled isotherm data for 46 neutral organic contaminants on F400(old). RMSE is for εscaled. Adsorption isotherm predictions were validated with TCE adsorption isotherm data on activated carbons OAW15, F600, G219 and Picazine. The results in Figure 4 show that the predicted isotherms are in excellent agreement with the experimental data, both for adsorbents with low (F600 and G219) and high (OAW15 and Picazine) oxygen contents. It should be noted that neither TCE nor the adsorbents, for which adsorption isotherms were predicted, were part of the QSPR calibration. 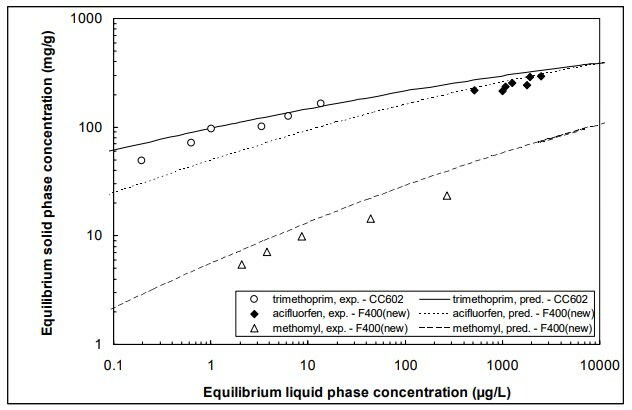 To further validate the developed QSPR, adsorption isotherm prediction for the antimicrobial compound trimethoprim and the pesticides acifluorfen and methomyl were compared with experimental isotherm data (Figure 5). Good agreement between predicted isotherms and experimental isotherm data was obtained for all three adsorbates. Figure 4. Adsorption isotherm data and predicted adsorption isotherms for TCE on adsorbents F600, G219, OAW15 and Picazine. Adsorption isotherm data from Li et al. (21). acifluorfen, and methomyl on adsorbents CC602 and F400(new). Adsorption isotherm data for trimethoprim (pKa for pyridine N is 7.1) were collected at pH 9.1, at which the neutral form is dominant. representative contaminants in the following emerging contaminant classes: (1) pharmaceutically active compounds (PhACs) - acetaminophen (pKa of phenol group is about 9.7); triclosan (pKa of phenol group is ~8); sulfamethoxazole (pKa of sulfonamide group is ~5.6); and trimethoprim (pKa of pyridine group is ~7); (2) endocrine disrupting compounds (EDCs) - ethinyl estradiol (pKa of phenol group is ~10.4); and testosterone; (3) chemical warfare agents (CWAs) - tabun (GA); soman (GD); distilled mustard; nitrogen mustard (pKa of tertiary amine group is ~6.8); and VX (pKa of tertiary amine group is ~9); (4) fluorotelomer alcohols (FTOHs) - perfluorohexanol (4:2 FTOH); perfluorooctanol (6:2 FTOH); perfluorodecanol (8:2 FTOH) and perfluorododecanol (10:2 FTOH); and (5) brominated flame retardants (BFRs) – decabromodiphenylether (BDE-209); tetrabromobisphenol A (TBBPA); and hexabromocyclododecane (HBCD). For ionizable contaminants, isotherm predictions are for the neutral form. Table 2 summarizes predicted adsorption capacities for the selected emerging contaminants on activated carbon F400(old) at equilibrium liquid phase concentrations of 0.001, 0.01, 0.1, 1.0 and 10.0 µg/L. 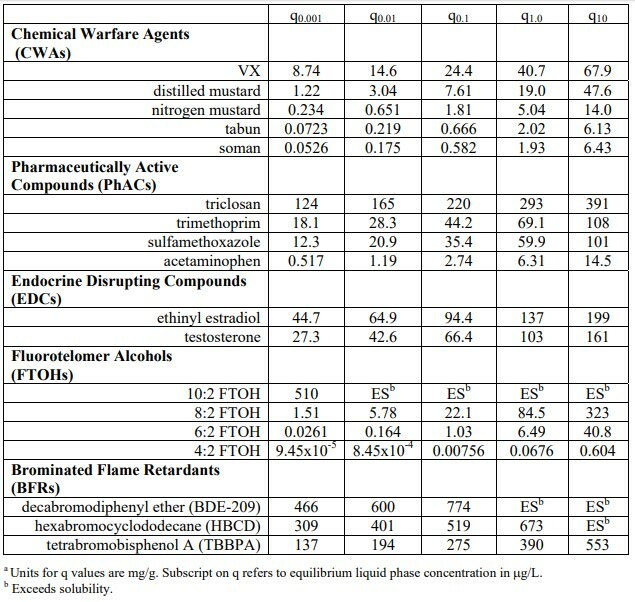 Among the chemical warfare agents, Table 2 shows that the most adsorbable compound is VX while the least adsorbable is soman. For the PhACs and EDCs, Table 2 shows that the neutral forms of triclosan, ethinyl estradiol, testosterone, trimethoprim, and sulfamethoxazole are all more adsorbable than the CWAs. Acetaminophen exhibited the poorest adsorbability among the selected PhACs. 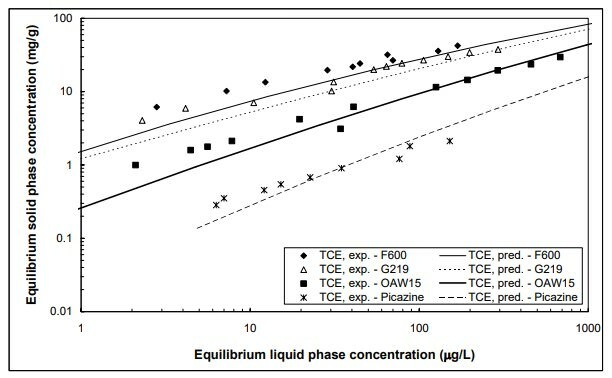 The adsorption capacities of FTOHs varied over more than 6 orders of magnitude at an equilibrium liquid phase concentration of 1 ng/L (Table 2); among the selected emerging contaminants, 4:2 FTOH exhibited lowest adsorbability while 10:2 FTOH exhibited the largest. 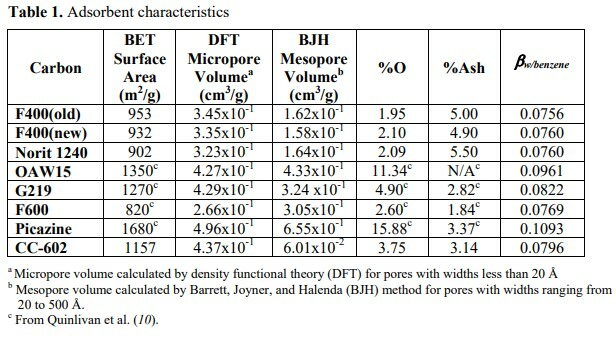 Regarding BFRs, Table 2 illustrates that this class of emerging contaminants is well adsorbed by activated carbon. procedure requires the development of a reference curve from N2 and CO2 isotherm data and knowledge of the adsorbent’s oxygen and ash contents. With respect to adsorbate properties, molecular descriptors are required that can be obtained quickly with molecular modeling software packages. Once the affinity coefficient of a target contaminant is calculated from the QSPR model and the affinity coefficient of water is calculated from the adsorbent’s oxygen content, a composite contaminant/water affinity coefficient can be obtained for the adsorbate/adsorbent pair of interest. This composite contaminant/water affinity coefficient can then be used to scale the reference curve such that the adsorption isotherm for the desired adsorbate/adsorbent pair is obtained. To date, only a limited external validation of the QSPR developed in this study was conducted. To enhance the confidence in the predictive powers of the developed QSPR, a more comprehensive external validation test should be conducted. #R-83134901-2. The information described in this article has not been subjected to the Agency's required peer and administrative review and therefore does not necessarily reflect the views of the Agency and no official endorsement should be inferred. Any mention of products or trade names does not constitute recommendation for use by the USEPA. (1) Polanyi, M. Adsorption von Gasen (Dämpfen) durch ein festes nichtflüchtiges Adsorbens. Verh. Deut. Phys. Ges. 18: 55-80, 1916. (2) Polanyi, M. Neueres über Adsorption und Ursache der Adsorptionskräfte. Z. Elektrochem. 26: 370-374, 1920. Remarks. Trans. Farad Soc. 28: 316-333, 1932.
with Energetically Nonuniform Surfaces. Chem. Rev. 60(2): 235-241, 1960. Chemistry and Physics of Carbon; Walker, P. L., (ed. ); Marcel Dekker, New York, Vol. 2, pp. 51-120, 1966. Surface and Membrane Science; Cadenhead, D. A. et al. (eds. ); Academic Press, New York, Vol. 9, pp. 1-70, 1972.
liquids from water solution. J. Phys. Chem. 75(1): 61-64, 1971. Analysis and Remediation. R. A. Meyers (ed. ), Vol. 1, John Wiley & Sons, New York, pp. 26-68, 1998. Organic Micropollutants from Activated Carbon and Pollutant Properties. Environ. Sci. Tech. 39(9): 3393-3400, 2005.
the Simultaneous Adsorption of Aqueous Organic Micropollutants and Natural Organic Matter. Water Research 39(8): 1663-1673, 2005. (11) Cazorla Amoros, D.; Alaniz-Monge, J.; Linares-Solano, A. Characterization of activated carbon fibers by CO2 adsorption. Langmuir 12: 2820-2824, 1996. Properties and Environmental Fate for Organic Chemicals. Lewis Publishers, Boca Raton, 1992. (13) Horvath, A. L.; Getzen, F. W.; Maczynska, Z. IUPAC-NIST solubility data series - 67. Halogenated ethanes and ethenes with water. J. Phys. Chem. Ref. Data 28: 395-627, 1999. (14) Syracuse Research Corporation, Interactive PhysProp Database Demo, http://www.syrres.com/esc/physdemo.htm, accessed April 8, 2006. (15) Tomlin, C. The Pesticide Manual: A World Compendium. 13th ed., C. D. S. Tomlin (ed. ), British Crop Protection Council, Alton, 2003. (16) Prausnitz, J. M; Lichtenthaler, R. N.; Azevedo, E. G. Molecular Thermodynamics of FluidPhase Equilibria. Prentice-Hall PTR, Upper Saddle River, 1999. (17) Advanded Chemistry Development, ACD/ChemSketch 8.0 Freeware, http://www.acdlabs.com/download/chemsk.html, accessed April 8, 2006. Standard Molecular Volume Definition and its Application to Generalized Born Calculations. J. Comp. Chem. 24(11): 1348-1356, 2003.
with Explicit Expressions for the Screening Energy and its Gradient. J. Chem. Soc. - Perkin Transactions 2(5): 799-805 May 1993. Relationships: Characterizing Several Polarity, Acid and Basicity Scales. J. Phys. Org. Chem. 12: 645–653, 1999.
and Pore Structure on the Adsorption of Organic Contaminants from Aqueous Solution. Carbon 40: 2085-2100, 2002.
from Dilute and Concentrated Aqueous Solutions by Activated Carbons. Langmuir 19: 9719-9723, 2003. Activated Carbons: Aqueous Phase, Gas Phase, and Water Vapor Adsorption Studies. Environ. Sci. Tech. 38(22): 5834-5841, 2004. The role of clays in human health has experienced a revival in interest due to advances in modern instrumentation [e.g., transmission electron microscopes (TEM), field emission scanning electron microscopes (FESEM), atomic force microscopy (AFM), and secondary ion mass spectrometers (SIMS)], that allow us to study surfaces of nano-scale minerals in situ within their natural environmental matrix. By identifying the special characteristics that make a particular clay antibacterial, we may elucidate some of the reasons these common nano-minerals not only have potential applications in medicine, but may also contribute to the general understanding of antibacterial mechanisms lending insights to potential cures. Recent reviews regarding uses of clay in achieving and maintaining human health have focused on the ancient practice of geophagy, which is the practice of eating earth materials containing clay minerals (Wilson, 2003; Ferrell, 2009). The purpose of geophagy is to elicit a healing response in humans through ingesting the easily available materials that may physically soothe an infected and inflamed gastrointestinal lining (Droy-Lefaix et al., 2006). Alternatively, clays have been used topically in mud spas (pelotherapy) to adsorb toxins from skin and provide heat to stimulate circulation for rheumatism treatment (Carretero et al., 2006; Gomes et al., 2007). Historical accounts of humans using ‘healing clay’ began with Aristotle (384-322 BC) (Mahaney et al., 2000) and Pliny the Elder (23–79 AD) later recounted the cure of intestinal ailments by ingestion of volcanic muds (Carretero et al., 2006). Of the many historical accounts of clays, muds, and soils used by people for ‘healing’, the scientific evidence of the action of clays for treating and healing ulcers, tumors, cysts, cancers, osteoporosis, etc, is lacking. Nonetheless, the observations of humans who have been ‘cured’ of illness by clay applications and the correlating photographic documentation (Brunet de Courssou, 2002; Williams et al., 2004) were the stimuli for our research into the healing mechanism of clays. We provide a general compilation of the descriptions of healing and the common mineralogical attributes of clays and clay minerals used in the past. In 2002, Line Brunet de Courssou reported to the World Health Organization (WHO), a summary of ~10 years of work in the Ivory Coast of Africa (east Africa), where she documented the use of specific clay minerals as therapeutic treatment of advanced Buruli ulcer disease (Brunet de Courrsou, 2002). However, she was unable to conduct additional experiments of traditional and accepted scientific studies due to lack of financial support. There have been several reports describing the antibacterial properties of natural and synthetic clay minerals (Herrera et al., 2000; Hu et al., 2005; Tong et al., 2005; Williams et al., 2004; Wilson, 2003; Haydel, 2008). Despite these studies and the clinical evidence suggesting that clay minerals promote healing in individuals infected with Mycobacterium ulcerans, the chemical interaction occurring at the clay mineral – bacterial interface, and the mechanism by which the clay minerals inhibit bacterial growth remains unknown. Our research into the healing process lead us to propose in vitro testing of the effect of ‘healing clays’ on a broad spectrum of human bacterial pathogens. We make an important distinction between ‘healing clays’ and ‘antibacterial clays’. While clays may heal various ailments by their unique physical properties (e.g., high absorbance, surface area, heat capacity, exchange capacity, etc. ), we have identified only a few natural clays that kill pathogenic bacteria. Building on the recent literature on healing and antibacterial minerals and compounds, this paper reviews the methods and analytical protocols we have established for investigating the antibacterial properties of clays. Healing practices of ancient cultures, as well as modern society, have depended on clay minerals with powerful adsorptive and absorptive properties to treat a variety of topical maladies. Adsorption is the process of attraction, binding, and accumulation of molecules or particles to a solid surface in a condensed layer. Absorption results when a substance diffuses or penetrates into a liquid or solid forming a transition zone or layer, often with a new composition, adjacent the substrate. Clay minerals are ubiquitous in nature and their adsorptive and absorptive capabilities have been exploited in a variety of cosmetics and pharmaceutical formulations. Traditionally, clay minerals are mixed with water for various periods of time (days to years) to form clay gels or pastes that can be applied externally for cosmetic or skin protective purposes (Carretero, 2002; Carretaro et al., 2007; Gomes et al., 2007). The high adsorption and absorption capacities, cation exchange capacity, as well as the extremely fine particle size of certain clays, e.g. smectites (expandable clay minerals) and kaolin group minerals are important reasons why these minerals are used to remove oils, secretions, toxins, and contaminants from the skin. By adsorbing and absorbing moisture and impurities from the skin, the clays also serve to cleanse and refresh the skin surface and to aid in the healing of topical blemishes, the major selling point for many cosmetics. Although consumers generally consider clays to be safe when applied topically, it is important to recognize that cosmetic firms must substantiate the safety of their products and that the U.S. Food and Drug Agency does not subject these products to pre-market approval. The intentional consumption of earth materials, such as clays, by humans and animals is known as geophagy (Wilson, 2003). This complex and poorly understood practice is largely attributed to religious beliefs, cultural practices, psychological disorders, dietary/nutritional needs, and medicinal benefits (Abrahams et al., 1996; Aufreiter et al., 1997; Hunter, 1973). Although often viewed as an abnormal behavior by medical practitioners (i.e., pica), geophagy is believed to be an adaptive phenomenon in mammals and primates and a learned behavior in various societal cultures (Klaus and Schmidt, 1998; Krishnamani and Mahaney, 2000). Historically, geophagy is believed to be practiced to remedy a physiological response to mineral nutrient deficiencies, such iron or zinc, to satisfy a dietary craving, and to ease psychosocial problems, including anxiety, stress, and obsessive-compulsive disorder (Lacey, 1990; Sayetta, 1986). However, several studies and medical reports indicate that ingesting large amounts of clay (>200 grams per day), particularly clay with a high cation-exchange capacity, can impede absorption of iron, zinc, and potassium, leading to iron, zinc, or potassium deficiencies (Arcasoy et al., 1978; Cavdar and Arcasoy, 1972; Cavdar et al., 1977a,b; Gonzalez et al., 1982; Mengel et al., 1964; Minnich et al., 1968; Severance et al., 1988; Ukaonu et al., 2003). The ingestion of dried clay minerals or a clay suspension is commonly used as a source of dietary elements, as a detoxifying agent, and as an allopathic treatment of gastrointestinal illnesses and acute and chronic diarrhea (Carretero, 2002). For example in Ghana, the iron, copper, calcium, zinc, and manganese consumed in clays were in the range of 2 to 15 percent of recommended dietary allowances (Hunter, 1973) and it was concluded that moderate ingestion of clays lacking high cation-exchange capacities could serve as a nutritional supplement for these essential elements. In the acidic environment of the stomach, the clay minerals could bind to positively charged toxins and serve as detoxifying agents to reduce bioavailability interfering with gastrointestinal absorption of the toxin (Hladik and Gueguen, 1974; Johns and Duquette, 1991; Mahaney et al., 1996; Phillips, 1999; Phillips et al., 1995). Over-the-counter pharmaceuticals that originally contained kaolinite, attapulgite, or clay-like substances (i.e. Kaopectate®) represent classic examples of the use of clay minerals by human populations to treat diarrhea and intestinal illnesses (Vermeer and Ferrell, 1985) and soothe gastrointestinal ailments. (Note: Kaopectate was reformulated in 2002 and now contains bismuth subsalicylate instead of kaolinite or attapugite.) Kaolinite has many medically beneficial attributes primarily related to its ability to adsorb lipids, proteins, bacteria, and viruses (Adamis and Timar, 1980; Lipson and Stotzky, 1983; Schiffenbauer and Stotzky, 1982; Steel and Anderson, 1972; Wallace et al., 1975). The study of medicinal applications of minerals requires collaborative efforts by many specialists with diverse expertise and educational backgrounds including, for example, geology, geochemistry, microbiology, environmental science, soils and agriculture, medicine, statistics, and pharmacology to name a few. Understanding the interactions of natural minerals and microbial systems is an immense undertaking, so there is no limit to the efforts of diverse scientific disciplines in these arenas. Because of this it is important to establish a basis of communication among the diverse scientific groups. Here we present some back ground and define some common terms used by geologists/mineralogists and clinical microbiologists in attempt to alleviate misconceptions across disciplinary boundaries. First and foremost, it is essential to define what clay is and how it differs from mud, soil, and minerals. In the field of geology clay is a size-based term for very fine-grained minerals with an estimated spherical diameter <2.0 µm and approximate density of 2.65 g/cm3 as defined by Stokes Law (Jackson, 1979; Moore et al., 1997). As gravel, sand, and silt are terms for sedimentary grain sizes, clay is the term for the finest fraction of sediments that all consist of accumulations of different minerals (e.g., quartz, feldspar, carbonates, etc.) and organic matter. Clay, when moistened with water, creates a mud-like consistency, comparable to that used in spas for pelotherapy. Soils, often comprise many minerals and especially clay-sized minerals and organic matter (humus), as this medium must be able to support life by exchange of ions through water and gas that fills the spaces between the solid particles (Voroney, 2006). Mud is a slurry of water and sediment dominated by clay and silt sized particles. A mineral is a natural solid with a generally uniform composition and repeating internal crystalline order. When the crystalline domains are nanometers in scale, they are sometimes referred to as disordered or poorly crystalline. Clay minerals exhibit a wide range of order/disorder and crystallinity. Most of the clay-sized fraction of sediments consists of clay minerals or phyllosilicates (defined below). Clay minerals are formed by weathering of other silicate minerals on and in the earth’s crust, or they may precipitate directly from a solution. Minerals that form deep in the earth are likely to be unstable under the lower temperature and pressure conditions on earth’s surface. When water and carbon dioxide from the atmosphere and from soil respiration interact with these minerals, they may dissolve often if the waters are acidic (carbonic acid) and the leached components precipitate as a variety of clay minerals (Giese and van Oss, 2002). Most of the healing clays described in the literature (e.g., Carretero and Lagaly, 2007 and papers therein) are bentonites. However, bentonite is not a mineral but is a generic term for rocks derived from ‘altered volcanic ash beds’. The ash is a layered sedimentary deposit that accumulates during volcanic eruptions. This ash produces mostly disordered solids but glassy particles formed by rapid quenching (cooling) of magma when the liquid material is thrown into the atmosphere. The volcanic ash layers, when compacted and infiltrated with water, alter primarily to kaolinite in acidic environments, smectite in mildly alkaline (seawater) environments, or zeolites in highly alkaline environments (Bohor and Triplehorn, 1993). The mineralogical variations occur depending on the chemical characteristics of the volcanic glass and the local water chemistry (Christidis, 1998). Smectite is a group of expandable clay minerals with a variety of structural and chemical differences that affect their surface charge and chemistry. Montmorillonite, commonly identified in ‘healing clays’, is one type of smectite. It has a structure of 2 tetrahedral sheets that sandwich a single octahedral sheet (Fig 1). The 2:1 structure forms layers that stack like cards with the space between cards called the ‘interlayer’. The collective of interlayer, octahedral, and tetrahedral sites of montmorillonite forms a mineral with an ideal chemical formula; R0.33+ (Al1.67 Mg0.33) Si4 O10 (OH)2 (where R represents interlayer cations; Moore and Reynolds, 1997). Many elements can substitute into these various structural sites. In addition water and organic compounds may be found in the interlayer sites and/or adsorbed on the edges and exterior surfaces of the crystal structure. Zeolites have properties similar to clays, but form tubes or cage-like structures that can also incorporate a variety of molecules and ions. Over time, if the bentonite is deeply buried and subjected to an increase in temperature, or if hot volcanic water percolates through the ash layer, the smectites will alter to form illites or other minerals that are stable under the higher temperature conditions. The point here is that a bentonite usually does not consist of a single pure smectite, and each natural deposit is mineralogically variable. Bentonite deposits are found worldwide wherever volcanic eruptions have taken place and preservation of the ash has exceeded erosion. Ten billion tons of bentonite are mined worldwide each year with about 35% produced in the western United States (primarily Wyoming). The second largest producer of bentonite is Greece (Grim and Güven, 1978), however, significant reserves are also found in many countries; Italy (Sardinia), India, China, and Australia to name a few. Many of the clays used in pelotherapy come from these deposits and localities (Cara et al., 2000; Veniale et al., 2007). While natural clay samples contain a variety of minerals and organic compounds, clay minerals can often be isolated from the sample by selecting the finest size fraction (<0.2 µm). It is very difficult to remove silica from the finest clay fractions, but other detrital minerals (feldspars, micas, carbonates, etc) are usually concentrated in the coarser fractions (1–2 µm) (Jackson, 1979; Moore and Reynolds, 1997). Clay minerals are phyllosilicates (phyllo is Greek for ‘leaf’ or layers) consisting of layers of silicates arranged in tetrahedral and octahedral sheets (Fig. 1). The clay silicate layers consist of sheets containing hexagonal rings of SiO4 (silicate tetrahedra) stacked on octahedral sheets containing primarily Al, Mg, and/or Fe bound to two planes of closest packed oxygen atoms and/or hydroxyl groups. The edge sharing octahedra may be filled with two trivalent (di-octahedral) or three divalent (tri-octahedral) cations for a total charge of +6 (Giese and van Oss, 2002). This charge is partially balanced by the −2 charge on oxygens, but the total charge balance depends on the structural arrangement and precise elemental substitutions within the silicate framework. Kaolinite (the predominant mineral employed for making porcelain) and its polymorphs are 1:1 clay minerals i.e. they have layers consisting of one tetrahedral sheet and one octahedral sheet. Smectite is one example of 2:1 clay minerals with layers containing an octahedral sheet sandwiched between two tetrahedral sheets (Fig. 1). The stack of two tetrahedral sheets to one octahedral sheet, has an interlayer with water, cations, and molecules of highly variable chemical composition. Layers of the 2:1 clay minerals may be stacked in a variety of orientations and held together by electrostatic and van der Waals forces (Brindley and Brown, 1980; Moore and Reynolds, 1997). When trivalent ions (e.g., Al3+) substitute for tetravalent Si4+ in the tetrahedral sheets, or divalent ions (Fe2+) replace Al3+ in the octahedral sheets, the basal surface (bottom plane of the tetrahedral sheets) develops a net negative charge. The magnitude and distribution of this charge can vary depending on where the substitutions take place (Güven and Pallastro, 1992; Johnston, 1996). Smectites are the most common alteration product of bentonites, and many varieties of smectite are present in the antibacterial clays. Cations are attracted to the negative surface of the silicate sheets, whereas anions are attracted to the positively charged sites where bonding take place at the edges of the crystalline structure (Moore and Reynolds, 1997). If this region collapses (water is removed) due to a high surface charge attracting cations (primarily K+) to interlayer sites, it forms an illite. Chlorite is another group of layered silicates but with hydroxide sheets (e.g., MgOH3) between the 2:1 silicate layers, and are known as 2:1:1 minerals. Giese and van Oss, (2002) present excellent diagrams of the crystallography of the major classes of clay minerals. Most natural clay samples contain mixtures of these four major groups of phyllosilicates; smectite, illite, kaolinite and chlorite. Table 1 summarizes the basic mineralogical classification of phyllosilicates. Within the 2:1 clays, the layer charge (interlayer cation occupancy) is used to distinguish the major clay sub-categories. Nonetheless, there are vast chemical substitutions and structural re-arrangements in clay minerals that result in the wide variety found in nature. Basic classification of phyllosilicate minerals based on the layer type and charge (electro static units). Compiled from Brindley and Brown, 1980; Moore and Reynolds, 1997; Giese and van Oss, 2002). The growth of clay crystals and changes that may occur in their chemistry and structure is complex (see reviews in Altaner and Ylagan, 1997; Srodon, 1999). However, it has been shown for sedimentary environments that clay minerals precipitate as small particles (<10 nm) and grow in diameter over time as water provides a continuous supply of components or ‘building blocks’ to the structure (Eberl et al., 1998; Nadeau et al., 1984). The crystallite size distribution of clay minerals in most natural samples is log-normal, meaning there are more small crystals than large crystals (Eberl et al., 2002). This distribution has been shown to result from the stunted growth of a large number of nucleated crystals from which a limited number of the clay crystallites continue to grow. Clay crystals can grow in a variety of morphologies depending on the temperatures and pressures of their geologic environment. At low temperatures (~50°C,) the crystallites tend to be irregular flakes. As temperature increases, rectangular laths may be found, and finally hexagonal plates may form at >100°C (Inoue et al., 1988; Lanson and Champion, 1991). The crystallite growth usually incorporates other dissolved elements into the clay structure, therefore a change in the water chemistry over time may be recorded in different sized crystals of clay (Clauer et al., 1997; Srodon, 1999; Williams et al., 2006). Most uses and research emphasis on healing clays has focused on the physical characteristics of clay minerals that benefit digestion or protect and cleanse the skin (Carretero, 2002). The adsorptive and absorptive properties of clay minerals have historically been the driving force behind the traditional use of healing and therapeutic clays. Initially, negatively-charged interlayer sites of clays will absorb positively-charged substances to their extensive surface area. Over time, many clay minerals may absorb substances in between the stacked silicate layers of the mineral, allowing for expansion and swelling or contraction. While the physical adsorption of water and organic matter is the most common attribute of healing clays, the geochemical mechanisms controlling antibacterial properties of clays have received significantly less attention. It is well known that metallic ions, such as silver, copper, and zinc, have strong inhibitory and bactericidal effects on a broad spectrum of bacteria (Berger et al., 1976; Domek et al., 1984; Gordon et al., 1994). Various forms of silver ions have been used to treat burn wound infections, osteomyelitis, urinary tract infections, and central venous catheter infections (Becker and Spadaro, 1978; Davenport and Keeley, 2005; Fox, 1968; Fox and Modak, 1974; Jansen et al., 1994; Liedberg and Lundeberg, 1990). In low concentrations (4 µg/ml), silver ions produced inhibitory and bactericidal effects with no obvious toxic effect on human blood cells (Berger et al., 1976). Although required by most living organisms at low concentrations, elevated levels of copper can inhibit the growth of some microorganisms and exhibit bactericidal activity (Domek et al., 1984; Gordon et al., 1994). The use of copper-coated products or copper alloys has been proposed for surfaces exposed to human contact to reduce the transmission of infectious microbial agents. Other metallic oxides, including zinc oxide, magnesium oxide, and calcium oxide, have antibacterial activity with demonstrated effectiveness against E. coli and S. aureus (Sawai, 2003). The nanometer particle size of these oxides, as well as titanium and silicon dioxide (Yamamoto et al., 2000; Yamamoto, 2001; Adams et al., 2006), have proven to be important for antibacterial activity. Zinc oxide has been used in a variety of dental composites to treat or prevent dental caries and as an endodontic sealer (Turkheim, 1955; Moorer and Genet, 1982; Siqueira and Goncalves, 1996). Nonetheless, the antibacterial mechanism has not been identified. The high cation exchange capacity of different clay minerals has been targeted in the creation of inorganic antibacterial materials. Synthetic antibacterial clay minerals are prepared by exchanging their native ions with known antibacterial ions such Ag (Ohashi, 1992; Ohasi et al., 1998; Marini et al., 2007). The rational being that the novel exchanged ions will be gradually released from the synthetic clay for long-term antibacterial effectiveness. Thus far, silver-loaded clays have been pursued more aggressively than other antibacterial chemical ion options, although copper-loaded mineral substrates have been recently investigated (Gant et al., 2007). The mineral group zeolites, also have vast adsorptive and absorptive capabilities through a rigid, porous, three-dimensional channel or tube in their basic cryalline structure. They are compositionally similar to clay minerals and also have a high cation exchange capacity (Baerlocher et al., 2007). With strong affinity for oxidized silver ions (Ag+), up to 40% (w/w), silver-exchanged zeolites have demonstrated antibacterial effectiveness against aerobic and anaerobic Gram-negative and Gram-positive bacterial pathogens, including Pseudomonas aeruginosa, Porphyromonas gingivalis, Prevotella intermedia, Staphylococcus aureus, Streptococcus mutans, and Streptococcus sanguis and have been used in various dental applications (Hotta et al., 1998; Kawahara et al., 2000; Matsuura et al., 1997). Another study investigated the mechanism of action of silver-exchanged zeolite and determined that physical contact with the bacterial cell, silver transfer into the cell, and/or the generation of reactive oxygen species attributed to the bactericidal activity of silver zeolite (Matsumura et al., 2003). However, while these inorganic products have antibacterial activity and low toxicity, issues related to the reduction of silver ions to elemental silver and subsequent loss of antibacterial effectiveness could be problematic (Li et al., 2002). Therefore, an oxidized form of Ag appears to be important for bactericidal activity of silver-exchanged zeolites. Vermiculite is another clay mineral that has been targeted for medicinal uses. Vermiculite is a smectite-like mineral, but with a high layer charge, thus a high attraction for cations (Mathieson and Walker, 1954; Mathieson, 1958). As an alternative to silver, it is speculated that copper-loaded vermiculite could offer reduced costs, improved stability, and better antifungal activity (Li et al., 2002). As demonstrated by antimicrobial testing, a copper-exchanged vermiculite (containing 5.5% Cu2+), as well as 200°C– and 400°C-heated copper-exchanged vermiculite, inhibited growth of E. coli (Li et al., 2002). Unlike the synthetic clays and chemical manipulations of clay minerals manufactured to kill certain types of environmental and clinical bacteria, we focus now on natural, untreated clay minerals that are effective at killing a broad spectrum of human pathogens. The detailed results have been published elsewhere (Haydel et al., 2008; Williams et al., 2008), but herein we outline the approach we use to evaluate the antibacterial activity of clays. Figure 2 schematically summarizes our approach to investigating the antibacterial properties of natural clays. We evaluated the effect of various clays and clay minerals on a broad spectrum of bacteria and determined whether the bactericidal effect was via a physical or chemical attack on the various pathogens. Again, our overarching goal is to understand how clay minerals kill bacteria in order to create new topical treatments for antibiotic-resistant skin infections and for large, necrotic skin ulcers. If we can identify the mechanism by which natural clay minerals kill a wide range of bacterial species, then it is possible that either natural clay deposits could be located and made available as an inexpensive treatment modality for topical infections or that materials with similar properties could be designed to provide a safe alternative to current antibiotics and antimicrobials. General scheme for evaluating and testing antibacterial clays. Within the past decade, the incidence of Buruli ulcer has dramatically increased in several countries in sub-Saharan Africa, Australia, Asia, Mexico, and Peru, leading the WHO to declare this disease a global health threat in 2004 (WHO, 1998). Despite being the third most common mycobacterial disease in immunocompetent humans after tuberculosis and leprosy (Weir, 2002), Buruli ulcer, considered a “neglected tropical disease” by the WHO, does not garner the attention given to other infectious diseases. Although the exact prevalence and burden of the disease are difficult to determine, Buruli ulcer is endemic in central and western Africa with more than 40,000 Buruli ulcer cases recorded in the African countries of Ivory Coast, Ghana, and Benin from 1978 to 2006 and some villages reporting rates as high as 16–22% (Amofah et al., 1993; Marston et al., 1995; WHO, 2007). The WHO estimates that the incidence of Buruli ulcer will surpass that of leprosy and could become more problematic than tuberculosis in some African regions (van der Werf et al., 1999; WHO, 2007). M. ulcerans is a slow-growing environmental mycobacterium with an unknown source or natural reservoir (Dobos et al., 1999). Human transmission is believed to occur via the skin by direct inoculation or an insect vector (Portaels and Meyers, 1999; Weir, 2002). Most individuals infected with M. ulcerans initially develop a small, painless, pre-ulcerative skin nodule or plaques with larger areas of indurated skin and edema (van der Werf et al., 1999). As the disease progresses over 1–2 months, the infected skin will begin to ulcerate with characteristic necrosis of the subcutaneous fatty tissues, deeply undermined edges, and vascular blockage. These necrotic ulcers can lead to very extensive skin loss, damage to nerves, blood vessels, and appendages, and deformity and disability, particularly in children (van der Werf et al., 1999; Weir, 2002). One study reported that 26% of patients with healed Buruli ulcers suffered from chronic functional disability (Marston et al., 1995). Currently, treatment of Buruli ulcer, depending on the size of the lesion, includes antibiotic therapy and/or surgical excision of the ulcerative lesion. Thirty years ago, variable successes in uncontrolled trials were demonstrated with heat treatment and hyperbaric oxygen treatment (Krieg et al., 1975; Meyers et al., 1974). However, the impracticality and costs of these treatments abrogate its usefulness in endemic and underprivileged populations. Phillips et al. (2004) used topical aqueous creams releasing nitrogen oxides to decrease the size of ulcers with minimal adverse side effects. Recently, Chauty et al. (2007) determined that a combination of rifampin (taken orally) and streptomycin (injected intramuscularly) successfully treated 47% of the cases and was more effective against small Buruli ulcer lesions (<5 cm in diameter). In addition, rifampin and streptomycin treatment converted early M. ulcerans lesions (nodules and plaques) from culture positive to culture negative (Etuaful et al., 2005). According to WHO guidelines (2004), combined use of streptomycin and rifampin is the recommended treatment of early Buruli ulcer lesions (nodules, papules, plaques, and ulcers less than 5 cm in diameter). For treatment of ulcerative lesions greater than 5 cm in diameter, combined antibiotic therapy for four weeks, followed by surgical excision of the lesion and another four weeks of antibiotic treatment is recommended (WHO, 2004). While surgery is a standard treatment for large ulcerative lesions, antibiotic therapy reduces the extent of surgical excision and infection recurrence (WHO, 2004). Since surgical treatment is often not available or practical in rural, endemic regions and possibly subjects patients to other infections, development of an effective and affordable drug treatment and new treatment modalities is a research priority for the control of Buruli ulcer (WHO, 2007). The treatment of Buruli ulcer by Line Brunet de Courssou employed two clay samples provided by different suppliers of ‘French green clay’ (Brunet de Courrsou, 2002). These clays are thought to be altered volcanic ash deposits from Central France. The dry clay is mixed with water and applied as a paste directly to the ulcerated lesions and extended healthy skin of infected patients. The course of treatment is to remove and renew the clay packs at least once a day. Within days of initiating treatment with clay poultices, the therapeutic properties of the clay minerals were demonstrated, with the initiation of rapid, non-surgical debridement of the destroyed tissue. Extended treatment with the clay poultices resulted in continued debridement of the ulcer, regeneration of healthy tissue, and wound healing. After several months of daily clay applications, the Buruli ulcer wounds healed with soft, supple scarring, allowing return of normal motor function (Brunet de Courrsou, 2002; Williams et al., 2004). These observations are highly relevant since antibiotic treatment is only effective for small early lesions (nodules and plaques <5 cm in diameter) and has generally been unsuccessful as the sole treatment for larger, ulcerative forms of Buruli ulcer disease (Chauty et al., 2007; van der Werf et al., 1999). Schematic representation of the cell envelopes of Gram-positive bacteria, Gram-negative bacteria, and mycobacteria. LPS, lipopolysaccharide. SOURCE? The use of antibiotics and chemotherapeutic agents during the past century represents one of the greatest advances in human health and has led to a remarkable reduction of morbidity and mortality related to bacterial infections. In modern medicine, antibacterial, antimicrobial, and chemotherapeutic agents are terms used to describe chemical agents effective at treating infectious diseases. Most of these agents are antibiotics, which by definition are low molecular weight byproducts of microorganisms that kill or inhibit the growth of other and susceptible microorganisms. The term ‘antibiotic’ is often incorrectly used to describe antibacterial or chemotherapeutic agents that are synthetically manufactured or modified by chemical processes, independent of microbial activity, to optimize their activity. Although the antibacterial clay minerals discussed herein are natural substances, they are not produced by microorganisms and are not considered antibiotics. In an ideal situation, antimicrobial agents disrupt microbial processes or structures that largely differ from those of the host. The majority of known antimicrobials function by affecting cell wall synthesis, inhibiting protein and nucleic acid synthesis, disrupting membrane structure and function, and inhibiting key enzymes essential for various microbial metabolic pathways. Chemotherapeutic or antibacterial agents can be either bacteriostatic or bactericidal. A bacteriostatic agent reversibly inhibits microbial growth and microorganisms will resume growth upon removal of the bacteriostatic agent. Since bacteriostatic antimicrobials do not kill the bacteria, elimination of the infection is dependent on the host’s resistance and immune response. When administered at sufficient levels, a bactericidal agent kills the targeted bacterial pathogen. However, it is important to realize that the effectiveness of the antimicrobial is largely dependent on the targeted bacterium. An antimicrobial agent that is bactericidal for one particular bacterial species may be bacteriostatic for another. Moreover, various antibacterial agents vary considerably in their range of effectiveness. A narrow-spectrum antibacterial is effective against a limited number of pathogens, usually Gram-positive or Gram-negative bacteria, but not both. A broad-spectrum antimicrobial is generally effective at destroying or inhibiting the growth of a wide range of Gram-positive and Gram-negative bacteria. The extensive use of antibiotics has led to an increase in antibiotic resistance in many pathogenic and clinically-relevant bacteria, including Mycobacterium tuberculosis, S. aureus, Enterococcus faecalis, and Streptococcus pneumoniae (Menichetti, 2005; Shah, 2005; Sharma et al., 2005; Zetola et al., 2005). Therefore, modern and innovative research approaches are needed to identify and generate new antimicrobials for treating infections that are resistant to existing antibiotics or for which there is no known effective therapeutic agent. Using antibiotic-sensitive and antibiotic-resistant bacterial strains obtained from the American Type Culture Collection (ATCC) and a local diagnostic laboratory, we have been investigating the antibacterial properties of the two clays, CsAg02 and CsAr02, used to treat Buruli ulcer patients. The CsAr02 mineral promoted or had no effect on bacterial growth (Haydel et al., 2008). In contrast, CsAg02 exhibits an extraordinary ability to kill pathogenic E. coli, Salmonella enterica serovar Typhimurium, P. aeruginosa, ESBL E. coli (which is resistant to 11 antibiotics), and Mycobacterium marinum (a species genetically closely related to M. ulcerans that also causes a cutaneous infection) as well as inhibit the growth of pathogenic S. aureus, penicillin-resistant S. aureus (PRSA), methicillin-resistant S. aureus (MRSA; and also resistant to 10 antibiotics) (Haydel et al., 2008). During the course of her observations, Brunet de Courssou suggested that the CsAg02 clay was not as effective in killing M. ulcerans as the CsAr02 clay (although this was not demonstrated microbiologically), but was more suited for promoting skin granulation after the mycobacteria were killed (Brunet de Courrsou, 2002). The scientific basis of the therapeutic differences or the healing characteristics of these two clay minerals is still under investigation. In vitro broad-spectrum antimicrobial activities of clay minerals were tested against bacterial strains that are recommended by the Clinical and Laboratory Standards Institute (CLSI; formerly NCCLS) as quality control strains for laboratory testing of antimicrobials (NCCLS, 2004). Bacteria are grown overnight in common laboratory liquid media and diluted with fresh medium to achieve an approximate initial density of ~107 bacteria per ml. Adjustment of each bacterial inoculum is performed using a spectrophotometer since the experimental microorganisms exhibit varying replication times in liquid media. To confirm the initial bacterial counts, serially-diluted bacterial cultures are plated on appropriate agar plates and colony-forming units are counted after incubation at 37°C. Before use in any susceptibility testing, all clay mineral samples are sterilized by autoclaving at 121°C (at 15 psi) for 1 h to assure removal of airborne, inherent, or contaminating microbes. To achieve a consistency similar to the hydrated clay poultices used to treat Buruli ulcer patients, 200 mg of clay minerals is added to 400 µl of the initial inoculum of bacteria in the appropriate growth medium. After the addition of the clay minerals, the bacteria - clay mineral mixtures are incubated in capped test tubes at 37°C in ambient air for 24 hours (NCCLS, 2004) with constant rotary agitation to ensure contact with the clay minerals and to prevent sedimentation. Positive controls for growth of bacteria in the absence of clay minerals are included in each series of independent experiments. To ensure that the clay samples were sterilized after autoclaving and maintained sterilization during storage, negative control growth experiments with clay minerals in liquid media are performed several times throughout the course of the study. These conditions revealed complete killing of E. coli, S. typhimurium, P. aeruginosa, and M. marinum by CsAg02 (Haydel et al., 2008). Given that the clays were hydrated with water for treating Buruli ulcer lesions and are generally hydrated with water for therapeutic use, we have initiated “use-derived” antibacterial testing of the clay minerals whereby the clay and the bacteria are incubated together in a sterile, deionized water solution. After growth in a liquid medium, bacteria are washed twice and suspended (~107 CFU) in 1 ml of sterile deionized water before the addition of clay minerals and subsequent incubation at 37°C. Depending on the type of clay, poultice consistencies used for therapeutic purposes are generally ratios of 1:2 or 1:3 (clay:water). To determine the effect of quantity, various amounts of the clays can be added to one ml aliquots of the aqueous bacterial suspension. Bacteria-clay mineral suspensions are incubated rotating at 37°C for 24 hours at which time serial dilutions of all samples are plated to determine bacterial viability. Minimal bactericidal concentration (MBC) is defined as the lowest concentration of a particular antibacterial agent that kills ≥99.9% of the bacterial population in a liquid medium. Initial testing of the two French green clays (in 2003) showed that only one of the clays (CsAg02) killed a nonpathogenic, laboratory strain of E. coli even though the two clays, CsAg02 and CsAr02, were very similar in general mineralogy with the dominant portion of the sample consisting of clay minerals as set out in Table 2 along with quartz, calcite, and feldspar (Williams et al., 2004). Subsquent testing of CsAg02 and CsAr02 against a pathogenic strain of E. coli revealed similar results (Haydel et al., 2008) and their mineralogical composition was very similar. The clay fraction was dominated by smectite, a group of expandable clay minerals, a common component of all of the antibacterial clays we have investigated. However, a substantial amount of illite is also present in the French clays. Notably, the illite-smectite crystals in the French clays are of extremely small size relative to natural illite and smectite reference materials from the Clay Minerals Repository (www.clays.org) at Purdue University (Fig. 4). Comparison of illite and smectite textures and crystal size. The standard reference materials (top) are much coarser than the French clays (containing both illite and smectite). The very small crystal size may play a role in the antibacterial mechanisms of clays (SEM images by Lynda Williams). In order to eliminate the possibility that other mineral phases were responsible for killing the bacteria, we separated sequentially smaller size fractions of the mineral mixture using centrifugation (Jackson, 1979). Evaluating the antibacterial effect of the coarse (1.0 –2.0 µm), medium (0.2–1.0 µm) and fine (<0.2 µm) size fractions independently against E. coli allowed us to eliminate detrital minerals (quartz, carbonate, feldspar) from the clays as potential participants in the antibacterial effect. We found that only the finest fraction (<0.2 µm) was effective against E. coli, while the coarser fractions had no effect on bacterial growth (Haydel et al., 2008; Williams et al., 2007). Furthermore, X-ray diffraction analyses of the finest clay fraction confirmed that the coarser detrital mineral phases had been largely eliminated. Smectite dominated the <0.2 µm fraction. Figure 5 shows two different morphologies of crystals in the <0.2 µm fractions of the French clays. The antibacterial clay has crystals as small as 20 nm, and this enormous relative surface area, controls the water chemistry when wet. The antibacterial French clay (CsAg02) has two clay crystal morphologies; 200nm diameter hexagonal plates (left sample analyzed by SEM, gold coated by L. Williams) and 20nm × 40nm rectangular laths (right sample uncoated on carbon planchet; by L. Garvie). The uncoated sample allows imaging of the very finest crystallites in the clay. Others have shown that particle size effects antibacterial activity for various oxides (e.g., ZnO, MgO), such that bactericidal activity increases with decreasing particle size (to 0.1 µm) (Yamamoto, 2001; Sawai, 2003). Adams et al. (2006) showed that nanoparticles of TiO, SiO, and ZnO are photosensitive, with the light promoting formation of reactive oxygen species. Further evaluation is needed to determine the potential role of oxides associated with the clay mineral surfaces in chemical reactions that could influence the survival of pathogens. One way to do this is to selectively chelate metal oxides out of the sample and evaluate the resulting antibacterial effect, or to remove hydroxyl and superoxide radicals before testing. Mossbaüer spectroscopy is another useful tool for evaluating oxide versus clay mineral–metal bonds in clay samples (Stucki et al., 1996). Next, we need to determine if the fine clay fraction was killing E. coli by a physical or chemical effect. Were the clays physically impeding a metabolic process of the bacteria by surface attractive forces causing the clay to wrap around, penetrate, or otherwise destroy the cell walls? Or, was the clay producing a toxic chemical that precipitates on the cell walls or that enters the bacterial cell inducing cellular death? By inserting a dialysis tube filled with an antibacterial clay suspension into a bacterial population in liquid growth media, Metge et al. (2007) showed that the bacteria were killed without physically contacting the clay mineral surfaces. Given this observation, we leached the antibacterial clay with distilled, deionized water. Two grams of the antibacterial clay was ultrasonified (using a Braun microtip ultrasonic disaggregator) in 40 ml water, then shaken for 24 hrs to equilibrate. The clays were removed from suspension by centrifuging for 3 hrs at 20,000 rpm (SS-34 rotor). The leachate was then tested against bacteria. Compared to control samples of E. coli in distilled water, the clay leachate also killed E. coli. This evidence suggested that the antibacterial clay killed by providing a toxin. Nonetheless, after water leaching, the clay sample continued to kill E. coli. In fact, separation of the different size fractions of the clay also required multiple washings and centrifugation cycles in deionized water, which did not eliminate the bactericidal effects of the minerals. These results indicate that the antibacterial agent is not highly soluble. The next test was to evaluate if the antibacterial agent(s) could be removed by cation exchange. Ions and molecules can be bound to the interlayer surface of the expandable clays or adsorbed on the edges. Cation exchange is performed by soaking the clay fraction of interest in a concentrated (1M) solution containing ‘preferred cations’ or ions with the best fit in ionic radius and charge for the interlayer exchange sites (Jackson, 1979). One can remove any chemical species that are not tightly bonded (fixed) in the clay structure. This is the commonly used procedure to determine the ‘cation exchange capacity’ of clay (Moore and Reynolds, 1997), but the process also removes ionic or molecular species that might be involved in the antibacterial mechanism. After cation exchange, we found that the smectite-rich clay samples (<0.2 µm fraction) no longer killed E. coli (Haydel et al., 2008), indicating that the antibacterial agent is linked to ions that are presumably in the exchangeable sites of the clay. However, the cation exchange will also affect the surface energy of the clay mineral and may affect the pH, of the clay surface (zero point of charge), so we attempted to evaluate these complicating factors. One common way to remove interlayer water and hydroxyl groups from clays is by progressive heating. In general, the clay becomes dehydrated, as the interlayer water is removed, by heating to 200°C. At 550°C or more (depending on chemical bonding), most iron-rich smectites dehydroxylate, meaning that all hydroxyl bonds in the octahedral layer are broken (Heller-Kallai and Rozenson, 1980). However, it is important to note that the temperature for dehydroxylation varies depending on the clay mineral structure and composition (Bish and Duffy, 1990). Upon heating to 900°C, the clay mineral structure is effectively destroyed, leaving only the oxide components. Progressive heat treatments were applied to the French antibacterial clay in order to eliminate some of the possible bactericidal elements from consideration. Heating to 200°C (24 hrs in air) removes volatile elements in addition to water, (including H, O, N, F, Cl, Br, I). Although it is important to consider how these elements are bound in the mineral structure, certainly their presence in the hydrated interlayer would be affected by temperatures leading to volatilization. Tests of the clay after heating to 200°C show that it still killed E. coli (Williams et al., 2008; Haydel et al., 2008). This heating step provides evidence that the antibacterial agent in the clay is not an inherent microorganism, as they would certainly be killed at this temperature, even if the clay had previously physically protected them. Heating to 550°C (24 hrs in air) showed significant oxidation of the French antibacterial clay as it turned from green to orange-red due to oxidation of Fe in the octahedral sites of the clay (Williams et al., 2008). However, the clay still killed E. coli (Haydel et al., 2008). This high temperature would be expected to volatilize elements including S, P, and Hg if they were not tightly bound in the phyllosilicate structure. Furthermore, this step of the process verifies that the antibacterial agent is not an organic compound as they are certainly eliminated at this high temperature. Heating to 900°C highly oxidized the French antibacterial clay (CsAg02) turning it a deep red and caused the clay to lose its antibacterial effectiveness (Williams et al., 2008; Haydel et al., 2008). The lost antibacterial effect could point to elements lost above 550°C as the active antibacterial agents, however the highly oxidized state may alter the toxicity of remaining elements, or recrystallization may change the availability of elements that were bactericidal before heating. The major oxides of both clay samples including Si, Al, Ca, Fe, Mg, Mn, and Ti remain, but the clays lose their coherent crystalline structure. This temperature leaves many refractory elements in oxidized form, but those lost between 550°C and 900°C include Na, K, As, Se, Rb, Cd, and Cs. Table 3 compares the abundances of the refractory elements in the two French clays before heating. Comparison of refractory elements in the antibacterial and non-antibacterial French clay samples. Highlighted elements are those removed by heating above 550°C. The conclusion from this heating analysis is that the more volatile elements or compounds are not necessary for the antibacterial action displayed by this particular clay. The experiments do not conclusively identify a toxic substance, but are a method for eliminating some of the variables from consideration. All of the tests and chemical manipulations of the French antibacterial clay (CsAg02) leave elemental components in abundances that are well below the minimal inhibitory concentrations (MIC) reported to be toxic to E. coli (Dopson et al., 2003; Nies, 1999; Wackett et al., 2004) and other bacteria tested (Haydel et al., 2008). However, MICs are usually tested at a neutral or near neutral pH, which does not attest to the fact that the pH and oxidation state of the metals must also be considered. Metal speciation is critical to their bioavailability and the subsequent interaction with bacteria (Reeder and Schoonen, 2006). Therefore, in the future we aim to establish what chemical species are soluble under the pH and oxidation state buffered by the clay mineral surfaces in order to evaluate the element mobility of antibacterial clays (Tateo and Summa, 2006). The whole process of transferring elements from a clay surface through water to a cell membrane involves numerous chemical reactions and variables that can be affected not only by the source clay and water chemistry, but also by the surface complexation of chemical species on the bacteria (Barrok et al., 2005). Cellular processes important for metabolism, nutrient transport, movement, and cell division are localized at the cell membrane, which is the reactive surface controlling chemical accommodation, and may vary with environment (Konhauser, 2007; Lalonde et al., 2008 a,b). The ability of a given bacterial species to modify its surface chemistry in order to adapt to various environmental stresses depends on the growth phase, regulatory networks, metabolic pathways, and chemical variables in the environment (Warren and Ferris, 1998; Lalonde et al., 2008 a,b). There are three general mechanisms by which bacteria can accommodate high concentrations of ions that may be toxic to the species (i) the ions may be expelled from the cell by efflux (Nies and Silver, 1995); (ii) the metal ions may complex into non-toxic molecules such as thiols (S-compounds) in the surrounding solution, or (iii) the metal ions may be reduced to a less toxic oxidation state in the cell (Nies, 1999). Unwanted reduced metal ions usually are eliminated from cells by an efflux system. However by application of antibacterial clay or its soluble compounds to the bacteria, there is the potential for precipitation of compounds that would inhibit efflux of toxins from bacteria. A geochemically-induced gradient in pH or oxidation state, imposed by the presence of the antibacterial clay mineral could clearly be damaging to the functions of even the most adaptive bacteria. Reactive oxygen species are another frontier for investigation of the possible inhibitors active against bacteria. Fenton-mediated reactions, for example, drive the oxidation of mineral-bound Fe2+ to generate hydroxyl radicals (Fenton, 1894; Schoonen et al., 2006; Cohn et al., 2006) that can damage cells. Furthermore, during active infections, it is important to consider the complexity of host-pathogen interactions, largely influenced by in vivo chemistry, in addition to the chemical interactions identified in vitro (Sahai and Schoonen, 2006). If we can integrate analytical protocols in the study of bacterial metabolism, adaptation, and pathogenesis with methods of mineral and chemical manipulation and characterization (see reviews in Banfield and Nealson, 1997; Reeder and Schoonen, 2006), the forward motion of identifying new antibacterial agents or processes will be much better served. In this era when bacteria are developing antibiotic resistance to existing pharmacological agents, the potential for discovery of new broad-spectrum antibacterial agents, such as natural clay minerals, to combat pathogenic bacteria would be particularly advantageous. Analysis of the chemical interaction occurring at the clay mineral – bacterial interface is being explored and will be pertinent in understanding the mechanism by which the clay minerals can inhibit bacterial growth. Initial investigations indicate that particular natural clay minerals can have striking and very specific effects on microbial populations. These effects can range from enhanced microbial growth to complete growth inhibition, and these opposite effects can occur with clay minerals of similar structure and bulk crystal chemistries. The key antibacterial agent is likely a trace element or transition metal groups stabilized by the ability of particular clay minerals to buffer the aqueous speciation of those elements involved in the antibacterial process. During the past 25 years, approximately 70% of newly discovered drugs introduced in the U.S. have been derived from natural products (Newman and Cragg, 2007). Topical treatments by clay minerals have considerable advantages over surgery or generalized antibiotic therapy due to the practical simplicity of the application in the area specifically affected, rather than ingestion of drugs with potential side effects. The broad-reaching impacts of antimicrobial mineral research with applications in topical antimicrobial dressings, wound care management, personal care, and animal care markets are obvious. The discovery that natural minerals harbor antibacterial properties should provide impetus for exploring terrestrial sources for novel therapeutic compounds. Often natural products, such as clays, which are heterogeneous in chemical composition and physical character, are rejected as therapeutic agents by regulatory agencies. Nevertheless, in comparison to organic antimicrobial agents, inorganic minerals are likely to be considerably more stable and heat resistant, making the development and use of inorganic antimicrobial agents particularly advantageous. Combining the availability of natural, potentially bioactive, resources with powerful combinatorial chemistry optimization methodologies could result in the development of new antibacterial agents to fight existing antibiotic-resistant infections and diseases for which there are no known therapeutic agents, such as advanced M. ulcerans infections. The work of Konhauser (2007) and his co-workers describe novel methods for studying environmental bacteria and their chemical interactions with minerals in sedimentary environments. Similar methods must be employed in clinical microbiological research on antibacterial minerals. For example, the forces of attraction between bacterial species and mineral surfaces (Bank and Giese, 2007), the formation of membrane vesicles and other mechanisms for accommodating environmental stresses (Mashburn-Warren et al., 2008), the response of various bacteria to oxidative and reductive variables, in addition to pH, should be evaluated. This new focus in medical geomicrobiology should grow exponentially, just as environmental microbiology has developed exponentially over the last three decades (Konhauser, 2007). Although the use of clays in human health has been promoted empirically and traditionally, perhaps since the beginning of mankind, our knowledge of natural mineral impacts on human pathogens is in its infancy. New technology for determining physical and chemical interactions in situ on the nano-scale will provide the keys to opening these doors (Skinner, 1997). We thank Catherine Skinner who invited our contribution to this special issue. This paper benefited greatly from careful reviews by Paul Schroeder, John Smoglia and Catherine Skinner. This work would not have been possible without collaborative efforts on the part of all researchers involved. Funding was made possible by the NIH-National Center for Complementary and Alternative Medicine. We also thank Line and Thierry Brunet de Courssou who brought the antibacterial clays to our attention; students and assistants, including Amanda Turner, Christine Remenih, Tanya Borchardt; and technical support from the Center for Solid State Science and School of Life Sciences, in particular Lawrence Garvie and Dave Lowry who assisted with electron microscopy. Abrahams PW, Parsons JA. Geophagy in the tropics: a literature review. The Geographical Journal. 1996;162:63–72. Adamis Z, Timar M. Investigations of the effects of quartz, aluminum silicates and colliery dusts on peritoneal macrophages in vitro. In: Brown RC, Gormley IP, Chamberlain M, Davies R, editors. The in vitro effects of mineral dusts. London: Academic Press; 1980. pp. 13–18. Altaner SP, Ylagan RF. Comparison of structural models of mixed-layer illite-smectite and reaction mechanisms of smectite illitization. Clays and Clay Minerals. 1997;45:517–533. Aufreiter S, Hancock RGV, Mahaney WC, Stambolic-Robb A, Sanmugadas K. Geochemistry and mineraology of soils eaten by humans. International Journal of Food Sciences and Nutrition. 1997;48:293–305. Baerlocher C, McCusker LB, Olson DH. Atlas of zeolite framework types. Amsterdam: Elsevier; 2007. p. 404. Banfield JF, Nealson KH, editors. Reviews in Mineralogy. v. 35. Mineralogical Society of America; 1997. Geomicrobiology: Interactions between microbes and minerals; p. 448. Barrok D, Turner BF, Fein JB. A universal surface complexation framework for modeling proton binding onto bacterial surfaces in geological settings. American Journal of Science. 2005;305:826–853. Bish DL, Duffy CJ. Thermogravimetric analysis of minerals. In: Stucki JW, Bish DL, editors. Clay Minerals Society Workshop Lectures: Thermal Analysis in Clay Science. Boulder, CO: The Clay Minerals Society; 1990. pp. 95–157. Brindley GW, Brown GC, editors. Crystal structures of clay minerals and their X-ray identification.London: Mineralogical Society; 1980. Pages. Brunet de Courrsou L. Study Group Report on Buruli Ulcer Treatment with Clay, 5th WHO Advisory Group Meeting on Buruli Ulcer. Geneva, Switzerland: 2002. Cara S, Carcangiu G, Padalino G, Palomba M, Tamanini M. The bentonites in pelotherapy: chemical, mineralogical and technological properties of materials from Sardinia deposits (Italy) Applied Clay Science. 2000;16:117–124. Carretero MI. Clay minerals and their beneficial effects upon human health. A review: Applied Clay Science. 2002;21:155–163. Carretero MI, Gomes CSF, Tateo F. Clays and human health. In: F. Bergaya F, Theng BKG, Lagaly G, editors. Handbook of Clay Science. Elsevier Ltd; 2006. pp. 717–741. Carretero MI, Lagaly G. Clays and health: an introduction. Applied Clay Science. 2007;36:1–3. Christidis GE. Comparative study of the mobility of major and trace elements during alteration of an andesite and a rhyolite to bentonite in the islands of Milos and Kimolos, Agean, Greece. Clays and Clay Minerals. 1998;46:379–399. Clauer N, środoń J, Francu J, Sucha V. K-Ar dating of illite fundamental particles separated from illite-smectite. Clay Minerals. 1997;32:181–196. Droy-Lefaix MT, Tateo F. Clays and Clay Minerals as Drugs. In: Bergaya F, Theng BKG, Lagaly G, editors. Handbook of Clay Science. Elsevier Ltd; 2006. pp. 743–752. Eberl DD, Kile DE, Drits VA. On geological interpretations of crystal size distributions: Constant vs. proportionate growth. American Mineralogist. 2002;87:1325–1334. Fenton HJH. Oxidation of tartaric acid in the presence of iron. Journal of the Chemical Society. 1894;65:899–910. Ferrell RE. Medicinal clay and spiritual healing. Clays and Clay Minerals. 2008;56:751–760. Giese RF, van Oss CJ. Colloid and Surface Properties of Clays and Related Minerals. New York: Marcel Dekker; 2002. Gomes CSF, Silva JBP. Minerals and clay minerals in medical geology. Applied Clay Science. 2007;36:4–21. Grim RE, Güven N. Bentonites: Geology, Mineralogy, Properties and Uses. New York: Elsevier Publishing Co.; 1978. Pages. Güven N, Pollastro RM. CMS Workshop Lectures 4. Boulder, CO: The Clay Minerals Society; 1992. Clay-Water interface and its rheological implications. Heller-Kallai L, Rozensen I. Dehydroxylation of dioctahedral phyllosilicates. Clays and Clay Minerals. 1980;28:355–368. Hunter JM. Geophagy in Africa and in the United States. Geographical Review. 1973;63:170–195. Inoue A, Velde B, Meunier A, Touchard G. Mechanism of illite formation during smectite-to-illite conversion in a hydrothermal system. American Mineralogist. 1988;73:1325–1334. Jackson ML. Soil Chemical Analysis--Advanced Course. Madison, WI: Jackson, M. L.; 1979. Johns T, Duquette M. Traditional detoxification of acorn bread with clay. Ecology of Food and Nutrition. 1991;25:221–228. Johnston CT. Sorption of organic compounds on clay minerals: a surface functional group approach. In: Sawhney BL, editor. Clay Minerals Society Workshop Lectures: Organic pollutants in the environment. Boulder, CO: The Clay Minerals Society; 1996. pp. 2–44. Klaus G, Schmid B. Geophagy at natural licks and mammal ecology. A review: Mammalia. 1998;62:481–497. Konhauser K. Introduction to Geomicrobiology. Oxford: Blackwell Publishing; 2007. p. 425. Lalonde SV, Smith DS, Owttrim GW, Konhauser KO. Acid-base properties of cyanobacterial surfaces I: Influences of growth phase and nitrogen metabolism on surface reactivity. Geochimica et Cosmochimica Acta. 2008a;72:1257–1268. Lalonde SV, Smith DS, Owttrim GW, Konhauser KO. Acid-base properties of cyanobacterial surfaces II: Silica as a chemical stressor influencing cell surface reactivity. Geochimica et Cosmochimica Acta. 2008b;72:1269–1280. Lanson B, Champion D. The I-S to illite reaction in the late stages of diagenesis. American Journal of Science. 1991;v. 291:473–506. Li B, Yu S, Hwang JY, Shi S. Antibacterial vermiculite nano-material. JOM-Journal of the Minerals Metals & Materials Society. 2002;v. 1:61–68. Mahaney WC, Hancock RGV, Aufreiter S, Huffman MA. Geochemistry and clay mineralogy of termite mound soil and the role of geophagy in chimpanzees of the Mahale Mountains, Tanzania. Primates. 1996;v. 37:121–134. Mahaney WC, Milner MW, Mulyono H, Hancock RGV, Aufreiter S, Reich M, Wink M. Mineral and chemical analyses of soils eaten by humans in Indonesia. International Journal of Environmental Health Research. 2000;v. 10:93–109. Marini M, Bondi M, Iseppi R, Toselli M, Pilati F. Preparation and antibacterial activity of hybrid materials containing quaternary ammonium salts via sol-gel process. European Polymer Journal. 2007;v. 43:3621–3628. Mathieson A. Mg-vermiculite: a refinement and re-examination of the crystal structure of 14.36 phase. American Mineralogist. 1958;v. 43:216–227. Mathieson A, Walker GF. Crystal structure of magnesium-vermiculite. American Mineralogist. 1954;v. 39:231–255. Moore DM, Reynolds RC. X-ray diffraction and the identification and analysis of clay minerals.New York: Oxford University Press; 1997. p. Pages. NCCLS. Performance standards for antimicrobial susceptibility testing. 14th ed. Wayne, PA: Approved standard M100-S15, National Committee for Clinical Laboratory Standards; 2004. Ohashi F. Antimicrobial and antifungal agents derived from clay minerals. J. Antibact. Antifung Agents, Japan. 1993;v. 21(11):591–595. Ohashi F, Oya A, Duclaux L, Beguin F. Structural model calculation of antimicrobial and antifungal agents derived from clay minerals. Applied clay science. 1998;v.12:435–445. Reeder RJ, Schoonen MAA. Metal speciation and its role in bioaccessibility and bioavailability. Reviews in Mineralogy and Geochemistry. 2006;v. 64:59–113. Sahai N, Schoonen MAA, editors. Reviews in Mineralogy and Geochemistry. v. 64. Geochemical Society and Mineralogical Society of America; 2006. Medical mineralogy and geochemistry; p. 332. Schoonen MAA, Cohn CA, Roemer E, Laffers R, Simon SR, O'Riordan T. Mineral-induced formation of reactive oxygen species. Reviews in Mineralogy and Geochemistry. 2006;v. 64:179–221. Siqueira JF, Jr, Goncalves RB. Antibacterial activities of root canal sealers against selected anaerobic bacteria. Journal of Endodontics. 1996;v. 22:79–80. Skinner HCW. Preface to geomicrobiology: Interactions between microbes and minerals. In: Ribbe PH, editor. Reviews in Mineralogy. Mineralogical Society of America; 1997. pp. 1–4. Srodon J. Nature of mixed-layer clays and mechanisms of their formation and alteration. Annual Review Earth and Planetary Science. 1999;v. 27:19–53. Stucki JW, Bailey GW, Gan H. Oxidation-reduction mechanisms in iron-bearing phyllosilicates. Applied Clay Science. 1996;v.10:417–430. Tateo F, Summa V. Element mobility in clays for healing use. Applied Clay Science. 2006;v. 36:64–76. Wallace WE, Headley LC, Weber KC. Dipalmitoyl lecithin surfactant adsorption by kaolin dust in vitro. Journal of Colloid and Interface Science. 1975;v. 51:535–537. Warren LA, Ferris FG. Continuum between sorption and precipitation of Fe(III) on microbial surfaces. Environmental Science & Technology. 1998;v. 32:2331–2337. Williams LB, Holland M, Eberl DD, Brunet T, Courrsou LBd. Killer Clays! Natural antibacterial clay minerals. Mineralogical Society Bulletin. 2004;v. 139:3–8. Williams LB, Hervig RL. Crystal-size dependence of illite-smectite isotopic equilibration with changing fluids. Clays and Clay Minerals. 2006;54:531–540. World Health Organization. World Health Organization targets untreatable ulcer: report from the first international conference on Buruli ulcer control and research; Report Number; Yamousoukro (Côte d'Ivoire): WHO; 1998. World Health Organization. Provisional guidance on the role of specific antibiotics in the management of Mycobacterium ulcerans disease (Buruli ulcer) Geneva: World Health Organization; 2004. World Health Organization. Buruli ulcer disease (Mycobacterium ulcerans infection) WHO Fact sheet No. 199. 2007. Yamamoto O, Sawai J, Sasamoto T. Change in antibacterial characteristics with doping amount of ZnO in Mg-O-ZnO solid solution. Int. J. Inorganic Materials. 2000;v. 2:451–454. Yamamoto O. Influence of particle size on the antibacterial activity of zinc oxide. Int. J. of Inorganic Materials. 2001;v. 3:646–646. Zhou N-l, Liu Y, Li L, Meng N, Huang Y-x, Zhang J, Wei S-h, Shen J. A new nanocomposite biomedical material of polymer/Clay-Cts-Ag nanocomposites. Current Applied Physics. 2007;v. 7S1:e58–e62. Microbial pollution and contamination that take place by microorganisms have produced various problems in industry and other vital fields, including medicine and infection, etc. 1, 2) Organic compounds such as quarternary ammonium salts and chlorine disinfectant have been used as conventional antibacterial agents for the elimination of microbial contamination,3) but noxious materials in the human body may be included in the organic agent.4) Therefore, novel pasteurization and antibacterial treatments have been required. Recently, the occurrence of antibacterial activity on ceramic powders has been pointed out with much attention as a new technique that can substitute for conventional ones using organic agents.5–7) On ceramic powders with antibacterial activity, zinc oxide has been found to show a marked antibacterial activity in the absence of light,8–12) and the antibacterial ability has been noticed. The use of zinc oxide as an antibacterial agent also has the following advantages: it shows strong antibacterial activity under the pH values in the range from 7 to 8, and zinc is a mineral element essential to the human body. The occurrence of antibacterial activity has been supposed to be due to the generation of active oxygen from its surface.10) However, it is known that the activity by active oxygen weakens with lengthening the diffusion distance of active oxygen until it reaches bacteria. Yamamoto et al. reported that activated carbons were excellent in affinity with microorganisms and adsorbed large amount of bacteria.13) Therefore, zinc oxide deposited in the activated carbon is anticipated to have pronounced antibacterial activity in the water containing bacteria, because of the short diffusion distance of active oxygen that reaches the bacteria. Assuming that pathological bacteria included in drinking water can be decontaminated by packing activated carbon containing zinc oxide into an ion-exchange column, the material is possible to use as a novel antibacterial agents to remove bacterial pollution. Spherical activated carbons containing zinc oxide were prepared through the carbonization of resins ion exchanged by zinc ion. The aim of the present work is to study the antibacterial activity of the obtained activated carbons and to quantitatively analyze active oxygen contributed in the activity. An ion-exchange resin (WK10: Mitsubishi Chemical, Co.) having a carboxyl group as exchangeable function group wa used as a starting material. A resin with a particle size of about 0.5 mm was treated for 24 h by an aqueous solution containing [Zn(NH3)2] 2+ complex. The amount of zinc ion in the treated resin was about 4.6 mol kg−1. The ion-exchanged resins were carbonized for 10 min in a high-purity nitrogen gas at temperatures ranging from 500 to 900◦C to prepare activated carbons containing zinc oxide. The thus obtained carbon samples with zinc oxide were suspended into physiological saline at concentrations ranging from 1.6 × 10−3 to 1.0 × 10−1 g m−3. They were used in antibacterial tests. The formation of zinc oxide in carbon samples was examined by X-ray diffraction measurements (XRD: RIGAKU, RINT-2500 VHF). The shape of the carbon samples was observed by a scanning electron microscope (SEM: JEOL, JXA840). In order to examine the distribution of zinc oxide in carbon samples, an energy dispersive x-ray analyzer (EDX) installed on the SEM was used on the cross-section of carbon samples. The amount of zinc oxide in the samples was determined by oxidizing at 900◦C in air. The specific surface areas of the samples were estimated by analyzing the adsorption isotherms of nitrogen gas at −196◦C (BET: Bell Japan Inc., BELSORP 28). In order to examine the pH values in bacterial growth, the carbon samples were dispersed into physiological saline at a concentration of 12.5 × 10−3 g m−3. After keeping the dispersed solution for 24 h, the pH values of physiological saline were measured. Escherichia coli 745 (hereafter, E. coli) and Staphylococcus aureus 9779 (hereafter, S. aureus) were used as test bacteria. These bacteria were cultured in a brain heat infusion broth (BHI: Eiken Chemical, Co.) at 37◦C for 24 h with shaking on a reciprocal shaker. The bacterial culture was suspended in a sterile physiological saline at a final concentration of about 1.0 × 10−4 CFU m−3 (CFU: Colony Forming Unit). By measuring the changes in the electrical conductivity with bacterial growth, we assessed the antibacterial activity of carbon samples.10, 12) The apparatus for measuring the conductivity was a Bactometer Microbial Monitoring System Model 64 (bioMeieux), as shown in Fig. 1. The electrodes exist at the bottom of the sample well, and the potential between the electrodes is 84 mV. Placing the bacteria into the wells of a module of the Bactometer was carried out as follows: the carbon samples were placed in a well containing a modified plate count agar (MPCA: Difco, Co) and then the bacterium suspension was dispensed into the well. After setting the module in the Bactometer, the change in the electrical conductivity was monitored during incubation at 37◦C for 30 h in the absence of light. After dispersing the prepared activated carbons into physiological saline at different powder concentrations, the active oxygen in the saline, such as hydrogen peroxide (H2O2), was measured by an oxygen electrode. The detection of H2O2 by oxygen electrode is possible to detect by using enzymes, such as catalase. Because the H2O2 → H2O + 1/2O2 reaction occurs by adding catalase into physiological saline, the concentration of H2O2 generated can be calculated from the concentration of O2 detected by the oxygen electrode. In order to examine the generation of H2O2 from zinc oxide itself, zinc oxide with the particle size of 1.0 µm (ZnO: Kanto Chemical Co., purity; 99.95%) was prepared by heating at different temperatures for 1 h in air. The obtained powders were dispersed into physiological saline at a concentration of 5.0 × 10−3 g m−3 and the generated H2O2 in physiological saline was measured by the process described above. of zinc oxide in the carbon samples was about 65 mass% for CS-500, and decreased with an increase of the carbonization temperature. However, the specific surface areas of the carbon samples increased with an increase in the carbonization temperature; that is, the value increased from 201 to 523 m2g−1. The pH values in physiological saline dispersed with carbon samples were found to be 5.6–5.7. The XRD patterns of the activated carbons containing zinc oxide are shown in Fig. 2. 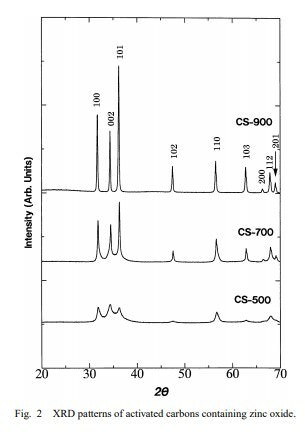 The diffraction peaks corresponding to zinc oxide of hexagonal type were detected in the carbon samples. With an increase in the carbonization temperature, these peaks of zinc oxide became sharper. Figure 3 shows SEM-micrograph of a carbon sample carbonized at 900◦C (CS-900). The shape was spherical with diameter of about 350 µm. The distribution of zinc oxide in the sample is shown in Fig. 4. From these observations, zinc oxide was found to exist homogeneously in the carbon sample. The shape and distribution of other samples were similar to that of CS-900. ples were added (control), the DT value was about 10 h. On adding carbon samples, however, the DT value increased with increasing powder concentration. The change in the DT value for S. aureus was similar to that for E. coli. The results indicate an increase in bacteriostatic effect on increasing the concentration of activated carbon containing zinc oxide in the medium; that is, the antibacterial activity increased with increasing powder concentration. Based on the change in the electrical conductivity described above, the bactericidal effect of all carbon samples was examined for two bacteria, S. aureus and E. coli. In Fig. 6, the bactericidal effect of three activated carbons towards S. aureus and E. coli is compared. The vertical axis represents the powder concentration at no detection of DT, i.e., bactericidal powder concentration. If the bactericidal powder concentration is small, it can be taken to show stronger bactericidal effect. 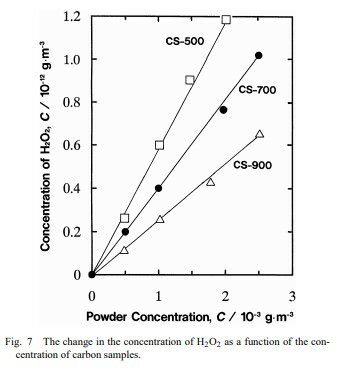 As the figure shows, the bactericidal powder concentration increased linearly along with increasing the carbonization temperature. The behavior on E. coli was comparable with that on S. aureus; that is, the bactericidal effect of carbon sample obtained at 500◦C is shown to be stronger than those prepared at 700 and 900◦C. With respect to E. coli, the bactericidal powder concentrations were higher than those for S. aureus; that is, the antibacterial activity of the carbon samples was found to be weaker towards E. coli than towards S. aureus. 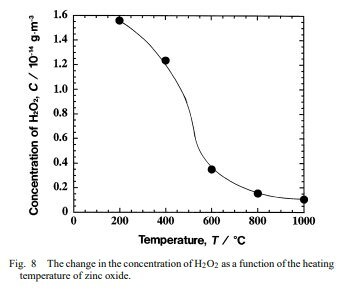 The specific surface areas of the activated carbon sphere containing zinc oxide increased along with increasing the carbonization temperature (Table 1). Nakagawa et al. 15) prepared activated carbons by carbonizing ion-exchange resins having different cations, such as zinc, nickel and copper ions. They clarified that the formation of micropores in the carbons was due to the pillars that were formed in the molecular structure of an ion-exchanged resin i.e., a pillar effect. For the present activated carbons, therefore, the increase in the specific surface areas is presumed to occur due to the pillar effect. The amount of zinc oxide in the carbon sample obtained at 900◦C was about 52 mass%, which was smaller than those in samples prepared at 500 and 700◦C (Table 1). The mass loss of zinc oxide is assumed to be due to the vaporization of zinc during carbonization of its resin. 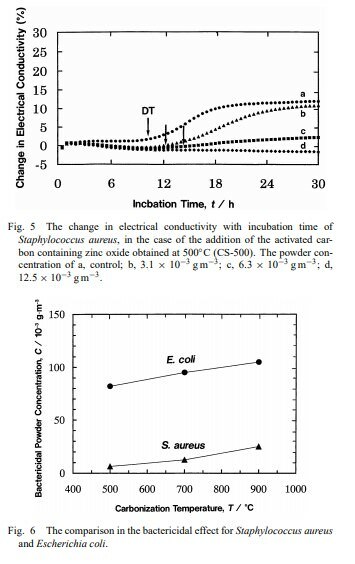 By measuring the changes in the electrical conductivity with bacterial growth, it was found that the antibacterial activity increased with increasing concentration in the activated carbons containing zinc oxide in the medium (Fig. 5). Also, the activity decreased with increasing carbonization temperature (Fig. 6). The following three factors may affect the antibacterial activity on activated carbons containing zinc oxide: (1) the pH value in the medium, (2) zinc ion eluted from zinc oxide in activated carbons and (3) active oxygen generated from the surface of zinc oxide. The pH values in physiological saline dispersed with carbon samples were 5.6–5.7 (Table 1). Radford et al. 16) and Cole et al. 17) reported that the pH values shown in present work did not affect the bacterial growth. In other words, factor (1) may have no effect on the activity. In order to examine the effect of zinc ion on the antibacterial activity, we confirmed the effect by using a physiological saline of zinc chloride with a concentration of 1.0 × 10−6 mol m−3. From the change in the electrical conductivity with bacterial growth, it was found that the DT value was similar to that in the case of the control; that is, no effect of factor (2) was observed. By oxygen electrode analysis, H2O2 was detected (Fig. 7), which may contribute to the antibacterial activity, because H2O2 is known to be effective for antibacterial activity.18) Also, Yamamoto et al. reported the generation of H2O2 from the surface of zinc oxide and considered this to be effective for the inhibition of bacterial growth.10) Therefore, the occurrence of antibacterial activity is related to the generation of H2O2 from zinc oxide deposited in activated carbons. The concentration of H2O2 decreased with increasing crystallinity of zinc oxide (Fig. 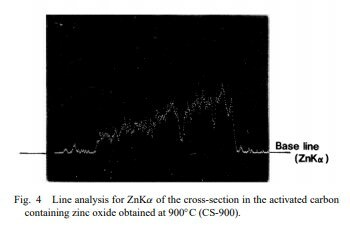 8) and carbonization temperature of resin ion-exchanged by zinc ions (Fig. 7). By XRD (Fig. 2), it was found that, with increasing carbonization temperature, the crystallinity of zinc oxide in activated carbons increased, and the amount of zinc oxide decreased (Table 1). Based on the discussion described above, the decrease in the antibacterial activity with increasing carbonization temperature is attributed to a decrease in the amount and an increase in the crystallinity of zinc oxide in activated carbons, i.e., a decrease in the H2O2 concentration generated from activated carbons. On activated carbons containing zinc oxide, the antibacterial activity for S. aureus was stronger than that for E. coli (Fig. 6). The structures and chemical compositions of the cell surface of the two kinds of bacteria used in this study are quite different. That is, thin layers of lipid A, lipopolysaccharide and peptidoglycan are present on the cell surface of E. coli, whereas there is only a peptidoglycan layer for S. aureus. Sawai et al. 19) reported that the activity of H2O2 was stronger on S. aureus than on E. coli. They also carried out an experiment to determine whether or not the H2O2 generated from zinc oxide was related to the antibacterial activity by using four kinds of antibiotics.20) In their investigation, the changes in the sensitivity of E. coli to the antibiotics suggested that H2O2 was one of the primary factors contributing to the antibacterial activity of zinc oxide. Saito et al. 21) reported that the H2O2 generated could readily penetrate the cell wall of the bacteria. Therefore, the differences in antibacterial action towards S. aureus and E. coli are attributed to the different sensitivities towards H2O2. 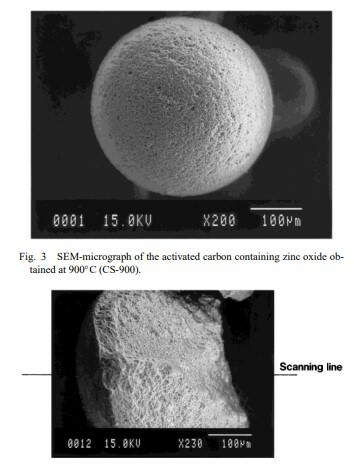 Activated carbon sphere containing zinc oxide was prepared by carbonizing the resin-exchanged zinc ion. Zinc oxide of hexagonal type was detected in activated carbons, and the zinc oxide in activated carbons was found to exist homogeneously in the carbons. With an increase in the carbonization temperature, the specific surface area of activated carbons increased, and the amount of zinc oxide in the carbons decreased. The antibacterial activity of activated carbons containing zinc oxide increased with a decrease in the carbonization temperature and an increase in the amount of zinc oxide in the activated carbons. From a comparison of the activity, it was found that the activity for S. aureus was stronger than that for E. coli. The generation of hydrogen peroxide was observed in physiological saline dispersed with activated carbons. The occurrence of antibacterial activity was attributed to the generation of hydrogen peroxide from the surface of zinc oxide deposited in activated carbons. 1) M. R. Infante, M. Diz, A. Manresa, A. Pinazo and P. Erra: J. Appl. E. Falsen, K. Pedersen, N. Rodin, R. A. Thompson and L. Edebo: Appl. Environ. Microbiol. 55 (1989) 2681–2688. 5) J. Sawai, H. Igarashi, A. Hashimoto, T. Kokugan and M. Shimozu: J.
Chem. Eng. Jpn. 28 (1995) 288–293. 6) J. Sawai, H. Igarashi, A. Hashimoto, T. Kokugan and M. Shimizu: J.
Chem. Eng. Jpn. 28 (1995) 556–561. 7) J. Sawai, H. Igarashi, A. Hashimoto, T. Kokugan and M. Shimizu: J.
Chem. Eng. Jpn. 29 (1996) 251–256. 8) O. Yamamoto, J. Sawai, M. Ishimura, H. Kojima and T. Sasamoto: J.
Ceram. Soc. Jpn. 107 (1999) 853–856. 9) O. Yamamoto, T. Shimura, J. Sawai, H. Kojima and T. Sasamoto: J.
Ceram. Soc. Jpn. 108 (2000) 156–160. 10) O. Yamamoto, M. Hotta, J. Sawai, T. Sasamoto and H. Kojima: J.
Ceram. Soc. Jpn. 106 (1998) 1007–1011. 11) O. Yamamoto, J. Sawai, K. Nakakoshi, H. Nakagawa, K. Miura and T.
Sasamoto: Tanso 2000(191) (2000) 2–7. K. Miura: Electrochemistry 68 (2000) 280–283. 14) G. Eden and R. Eden: IEEE Trans. Biomed. Eng. 31 (1984) 193–198. 16) S. A. Radford and R. G. Board: Appl. Microbiol. 20 (1995) 11–13. 18) J. Lorence: Manuf. Chem. 69 (1998) 22–27. 19) J. Sawai, O. Yamamoto, M. Hotta, H. Kojima and T. Sasamoto: J. Chem. Soc. Jpn. 1998(9) (1998) 633–635. and H. Kojima: J. Ferment. Bioeng. 86 (1998) 521–524. Activated charcoal is created by the partial oxidation of various organic materials, then treated to increase its surface area for use as a general-purpose antidote.1It contains a highly convoluted surface that can bind materials or gas, and carry it safely through the digestive system with a highly absorptive surface.2 Activated charcoal is administered in emergency medical situations, such as a drug overdose or poisoning. Its absorbing ability has been suggested as effective in removing some teeth staining agents. Bleaching: “Bleaches contain an active ingredient, most often carbamide peroxide or hydrogen peroxide in concentrations of 10-22%, which oxidize certain stains to reduce their coloration on the surface and within some pores or cracks on teeth.”4. Non-bleaching: “Non-bleaching procedures work by physical and/or chemical action to remove surface stains. All toothpastes rely on mild abrasion to remove surface stains between dental visits. Whitening toothpastes have special chemical or polishing agents that provide additional stain removal.”4 Abrasion is used to remove the staining agents, but desirably, the enamel will not be abraded. Nature’s Way, a manufacturer of activated charcoal, claims that the sole ingredients to their product are the gelatin capsule and the pure activated charcoal itself. No preservatives are added,2 therefore we concluded that the charcoal has no chemical bleachants, and only abrasion would be used to whiten teeth with the charcoal. Although abrasion supports removal of surface stains, its effects should be minimalized due to the fact that excess abrasion can cause gingival recession, enamel loss, and heightened sensitivity. 7 The abrasive concentrations in most paste and gel dentifrices are 50% to 75% lower than those of powder dentifrices. Therefore, powders should be used more sparingly and with greater caution by patients, especially those with exposed cementum and dentin, to avoid excess dentinal abrasion and pulpal sensitivity.7 “The ideal toothpaste should provide the greatest possible cleaning action on tooth surfaces with lowest possible abrasion rate.”7 The abrasive nature of charcoal powder on enamel has not yet been investigated. To assess activated charcoal’s abrasive nature in a quick manner, we turned to dental acrylic. Dental acrylic is known to be abraded by toothpaste and can provide a quick screening assessment of its abrasive potential. We consider whether the charcoal’s abrasive characteristics may outweigh the benefits it may produce as a whitening agent. We examined whether charcoals abrasion was significant compared to rate to toothpaste and water. We preformed 2,000 strokes by hand in a back and forth motion with uniform pressure using a separate toothbrush per dentifrice, and compared the appearance of the surfaces after abrasion with each medium. Adhesion of particles was also noted. We observed that activated charcoal was more abrasive than a whitening toothpaste on acrylic resins. Our research does not prove that activated charcoal is unsuitable for intraoral use; however, someone using this treatment may have a combination of composite materials and enamel that may not be suitably whitened by the treatment. The fine black charcoal powder may become embedded in defects such as margins or cracks present on older dentition. We plan to broaden our testing to examine the whitening and abrasive effects of activated charcoal on teeth. Dorland. Dorland's Illustrated Medical Dictionary, 32nd Edition. W.B. Saunders Company, 2012. <vbk:978-1-4160-6257-8#outline(3)>. "Activated Charcoal." Nature's Way. Nature's Way Products, Inc, 2015. Web. 7 Mar. 2015. <www.naturesway.com/Activated-Charcoal-100-Caps>. Summitt, James B.. Fundamentals of Operative Dentistry: A Contemporary Approach, 3rd Edition. Quintessence Publishing (IL), 012006. <vbk:0-86715-452-7#outline(15.4.3)>. Robinson, Debbie, Doni Bird. Essentials of Dental Assisting, 5th Edition. Saunders, 2013. <vbk:978-1-4377-0423-5#outline(20.13)>. Association, American Dental. ADA/PDR Guide to Dental Therapeutics, 5th Edition. Thomson Healthcare, 092009. <vbk:978-1-56363-769-8#outline(12.4.2)>. Anusavice, Kenneth J. Phillips' Science of Dental Materials, 12th Edition. W.B. Saunders Company, 2013. <vbk:978-1-4377-2418-9#outline(11.11)>. Fale conosco através do e-mail [email protected] ou pelo WhatsApp (48) 9105-1166. Nosso horário de atendimento é de Segunda à Sexta das 9h às 18h e aos Sábados das 8h às 12h.